In this article, I thought of doing some reading on the benefits of good blood circulation on our body. I know improved blood circulation is a good thing, but what are the specific benefits? The folowing are the 6 key benefits. According to sann.net, our body fats seems to melt away from some areas than other. Meaning, when you are trying to loose weight and cut down on your body fat, it is likely you will experience uneven fat loss. Your upper-body will tend to lose more fat compared to your lower-body. This is due to the fact that the fats in your lower-body has less blood flow than your upper-body fat. Futhermore, your lower-body fat doesn’t have the same lipase activity. Lipase is the enzyme that triggers the release of fatty acids from stored fat into the bloodstream. The dimpled, orange-peel-like appearance of cellulite is reduced by stimulating blood flow to the area through various methods, including dry brushing, rebounding on a trampoline and massage. Varicose veins are abnormally enlarged superficial veins in the legs. The veins may ache or cause itching or a sensation of tiredness. 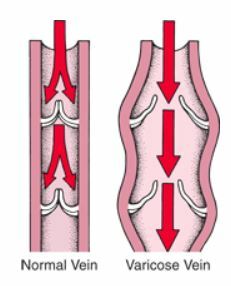 In normal vein, the cusps of the valves close to prevent backward flow of blood. In a varicose vein, the cusps cannot close because the vein is abnormally widened. Consequently, blood can flow in the wrong direction. Elastic stockings (support hose) compress the veins and prevent them from stretching and hurting. People who do not want surgery or injection therapy or who have a medical condition that prevents them from having these treatments may choose to wear elastic stockings. Muscle pain is a universal ailment that not only reduce your mobility, but it can hurt your motivation as well. There are many potential causes for muscle soreness, ranging from over-exercising to dehydration, but there is one factor that is often overlooked as a primary culprit and that is poor blood circulation. By improving your blood circulation, it will reduce muscle pain. One of the most common digestive issues today is bloating. It is uncomfortable and embarrassing that many of us decide to start eating healthier foods in order to avoid this occurrence. But what if this doesn’t help? How can you get rid of gas and bloating fast? An improved blood flow will cause your heart to beat faster and this helps to release the gases in your body. When you have strong uterine contractions, the blood supply to the uterus is momentarily shut down, depriving the uterus muscle of oxygen and setting up the cycle of menstrual cramps and pain. Increase blood flow to your lower body. There you have it. The above are my 6 findings from doing my reading online on the benefits of increase blood flow in your body. Thank you for reading thus article and I hope my sharing has been helpful to you. Thanks so much for sharing this article about good blood circulation. I always have dysmenorrhea and never thought that increasing blood flow will help because I thought exercising is enough. I will certainly research on what I can do to increase blood flow to my lower body. Hi Khayrie, thanks for your comment. I am glad my article has been useful to you.